I am looking for a way to normalize the sound in MANY MP3 files I have. Some have low sound, while others are louder so I have to turn the volume up or down depending on the song. What ways are there to do this for all files. I specially would like to do it via the terminal but GUI ways are also accepted. With Audacity we can easily batch process files to apply conversions or effects to many files in a list. To do so we first have to define a "Chain" containing the effects we want to apply. 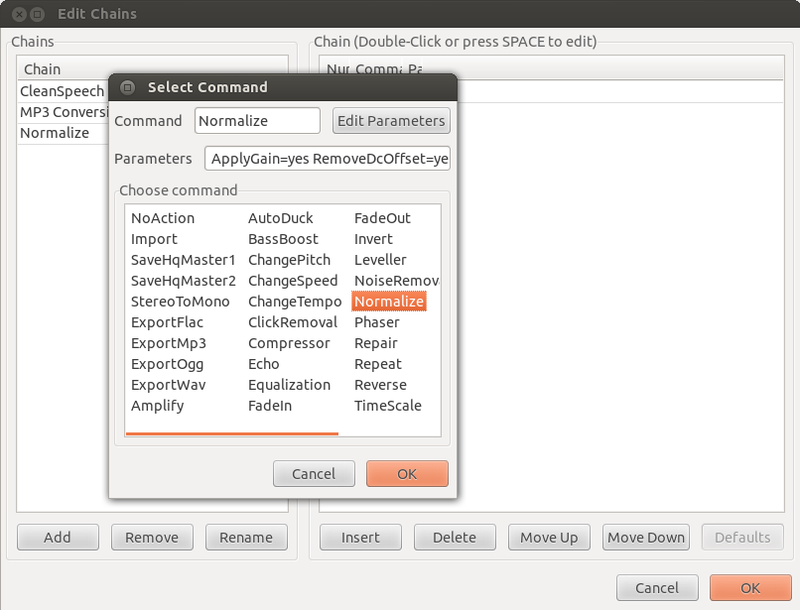 Then choose the effect and it's parameters to insert to the chain (here shown for default values and the Normalize effect). Important: we always need to also add the effect "Export MP3" (or any other export format) for saving the resulting conversion to disk. When done leave this window with OK to open "File --> Apply Chain...". Select the Chain we have just created and load all files you need with "Apply to files...". Several files can be selected from the file chooser that opens. 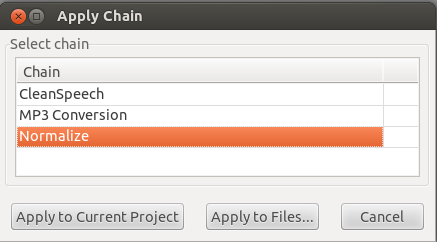 Processed files will be saved in a new subdirectory "cleaned" in the original's path. MP3-support is added to Sox with libsox-fmt-all . Note: That package was removed on purpose on ubuntu 15.04. Debian proposes the python-rgain package as replacement (The advantage is that 'replaygain' supports several file formats, namely Ogg Vorbis , Flac, WavPack and MP3. Also, it allows you to view existing Replay Gain information in any of those file types). After installing it, run replaygain. Alternatively, get the .deb file for 14.04 (the latest) from here. Install as usual. After that, you need to run sudo apt-get -f install to correct some dependencies issues. I would use this project Normalize, it's a command-line tool for normalizing audio files. Looks to be exactly what you need. Can do batch processing and doesn't require resampling to intermediate formats. It's in the package repos as normalize-audio, sudo apt-get install normalize-audio. This is a build maintained upstream by Debian so it should be in anything LTS or newer and is built with mp3 compatibility (tested). There is a good manpage man normalize-audio to explore the options but the commands defaults appear to work well. For batch processing (normalize volume across multiple files), normalize-audio -b *.mp3 or specify individual filenames instead of using wildcards. Basically my solution was the script in post #8. It works for mp3, flac, and ogg input files, possibly others but definitely not wav. orig_gain="$(normalize-mp3 -n "$line" | cut -d 'd' -f1)"
echo "Gain Difference will be: $gain_difference""db"
normalize-ogg --mp3 --bitrate "$3" -g "$gain_difference""db" -v "$line"
However, when I used to keep my music library in mp3 format, I used to use mp3gain as well, just as Philippe suggested. The dead simplicity of it is great and I really liked it. The problem with normalize-audio though is that it does decode an re-endcode the files, so there is some sound degradation. But unless you're an audiophile and your mp3's are encoded at a high bitrate you shouldn't notice much difference. The thing I noticed with mp3gain though was that no matter what options I tried I couldn't get everything in my collection to be exactly the same db level, which is what I want so that I never have to adjust the volume from one track to the next. This script does exactly that. Sorry for being so long winded. Hope this helps. This package provides a Python package to calculate the Replay Gain values of audio files and normalize the volume of those files according to the values. Two basic scripts exploiting these capabilities are shipped as well. Replay Gain is a proposed standard designed to solve the very problem of varying volumes across audio files. Install: sudo apt install python-rgain. -f, --force Recalculate Replay Gain even if the file already contains gain information. Since only calculate/change replaygain value, is also faster: With an average PC (Intel i7-6500U, 8GB RAM): ~20 files/minute. I liked Neil's answer the most, because it doesn't introduce correlation between audio files: just pick one gain level and adjust everything to it. However I had some problems parsing the output of normalize-ogg with some files I have. There is also one nasty issue with bc: it doesn't do real rounding, it only truncates. So eventually I gave up on shell scripting and moved to python. Note1: the exiftool part might be overkill but I wanted to be 100% sure that the original bitrate would be preserved. Note2: this will overwrite the originals, if you want to preserve them, use --backup in the last call to normalize-ogg. But I found more practical to keep a copy in a separate, safer, directory. Note3: this solution deals with ogg files, but it's trivial to adapt it to mp3, just replace the occurrences of "ogg" with "mp3". Not the answer you're looking for? Browse other questions tagged sound mp3 or ask your own question. Is there a way to have Clementine normalize my music? No Sound In Ubuntu 16.04!